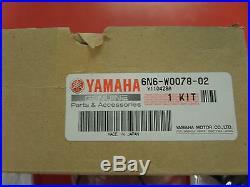 This Yamaha 6N6-W0078-02-00 Yamaha Water Pump Repair Kit contains the following OEM parts. 61A4432202 - INSERT, CARTRIDGE (1). 6E54432300 - OUTER PLATE, CARTRIDGE (1). 6E544315A0 - GASKET, WATER PUMP (1). 9360612019 - PIN, DOWEL (2). 9011908M14 - BOLT, WITH WASHER (4). 9028004M05 - KEY, WOODRUFF (1). This 6N6-W0078-02-00 Yamaha Water Pump Repair Kit will fit the following outboard engines. 2000 F115TLRY REPAIR KIT 2. 2000 F115TXRY REPAIR KIT 2. 2000 LF115TXRY REPAIR KIT 2. 2001 F115TLRZ REPAIR KIT 2. 2001 F115TXRZ REPAIR KIT 2. 2001 LF115TXRZ REPAIR KIT 2. 2002 115TLRA REPAIR KIT 2. 2002 115TXRA REPAIR KIT 2. 2002 130TLRA REPAIR KIT 2. 2002 130TXRA REPAIR KIT 2. 2003 115TLRB REPAIR KIT 2. 2003 115TXRB REPAIR KIT 2. 2003 130TLRB REPAIR KIT 2. 2003 130TXRB REPAIR KIT 2. 2004 115TLRC REPAIR KIT 2. 2004 115TXRC REPAIR KIT 2. 2004 130TLRC REPAIR KIT 2. 2004 130TXRC REPAIR KIT 2. 2005 115TLRD REPAIR KIT 2. 2005 115TXRD REPAIR KIT 2. 2006 and Later 115TLR REPAIR KIT 2. 2006 and Later 115TLR_0509 REPAIR KIT 2. 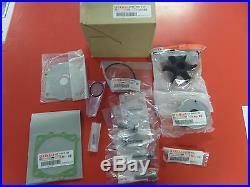 The item "Yamaha 115 130 F115 Outboard Water Pump Repair Kit 6N6-W0078-02-00 OFFICIALYAMA" is in sale since Tuesday, October 28, 2014. This item is in the category "eBay Motors\Parts & Accessories\Boat Parts\Outboard Engines & Components\Other". The seller is "suncityrvs" and is located in Anthony, Texas.